News: Warband of Corinth, now available! 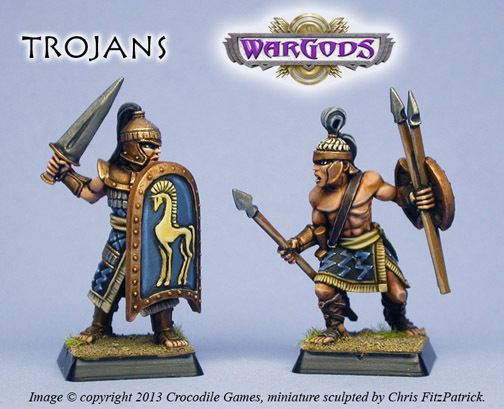 The new range of miniatures for Corinth is available now, in the CROC STORE! Arrogant and wholly corrupt, the Corinthians are the wealthiest city-state in all of Hellas. The army of Corinth is equipped with the finest weapons and armor, their shields emblazoned with a white winged horse, and wearing luxurious cloaks of the deepest black – a grand sight on the battlefield, even if their bravery is sometimes questioned. Yet what need is bravery, when enemies can be bribed and betrayals bought with full coffers of Corinthian silver? The Corinth miniatures were sculpted by Todd Harris and Chris FitzPatrick, based on concept art by Des Hanley. Corinth color painting by Paul Jeacock. The display models were painted and photographed by D Felicity FitzPatrick. To see LARGER painted images of all of these Corinth models, check out this thread on the Croc Forum. Want to know more about Corinth in the WarGods world? Check out this preview from our upcoming rulebook, with rules and background for Corinthian warbands: Download PDF. News: Croc Games at GenCon 2018! 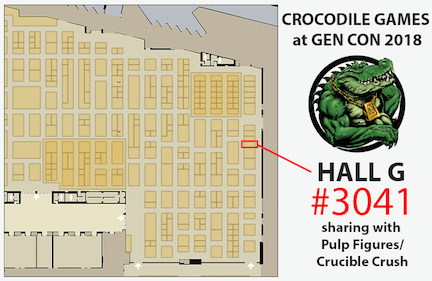 Only one week until GenCon Indy, and Croc Games will be there. We'll be sharing space with our friends at the Pulp Figures booth, #3041, Hall G.
We'll have convention specials, new miniatures for sale, and previews from the upcoming rulebook to check out. And lots of painted display miniatures and terrain to see. If you'll be in Indy, be sure to stop by and say hello! News: The Hydra, now available! We are happy to announce that our Cyclopes are in-stock, and now available for purchase! The Cyclopes miniatures were sculpted by Todd Harris, and the display models painted by Felicity FitzPatrick. Each model is a little over 3" tall, making them about 18 feet tall (if the were real - they are not, of course!). The head/neck joint of each Cyclops is the same, so you could put each head on either body. Also, each Cyclops has a separate bit hanging from his belt - one has a huge hammer and tongs, for helping Hephaestus at his forge, the other has a big jug of wine and the leg of a slow-moving farm animal... in other words, lunch! Each of these belt ornaments have a universal connection, and so they be swapped onto the other Cyclops if you like. So, collectors who like lots of variety can make 4 different Cyclopes by swapping their heads and gear around! Each is a resin and pewter model supplied with a laser-cut wood base. The resin components were cast by our friends at "On the Lamb" games, and they did a super job capturing the detail and nuance of Todd's original sculpture. 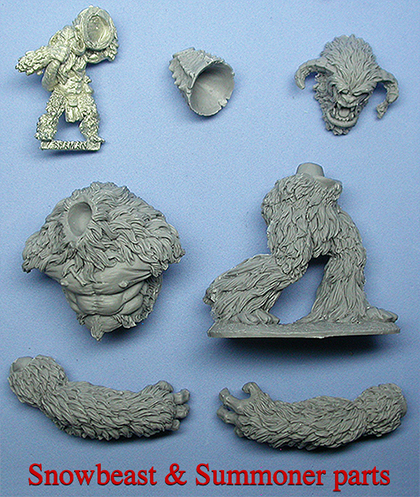 The miniatures are supplied unpainted, and require some assembly. 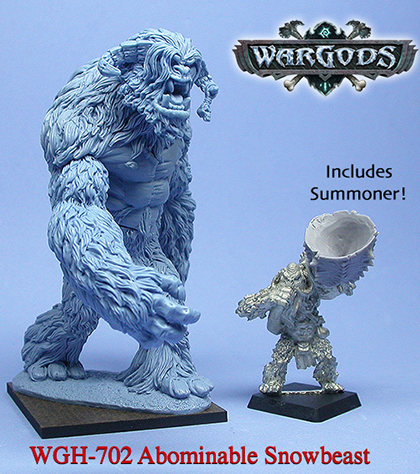 We also have a downloadable PDF of the Cyclops rules for WarGods of Olympus, available HERE. 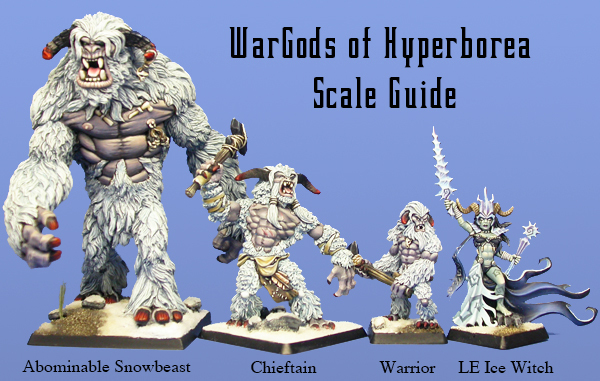 The above photo shows how tall the Cyclopes are compared to a 28mm miniature. We think the unlucky Trojan may be in a spot of trouble! 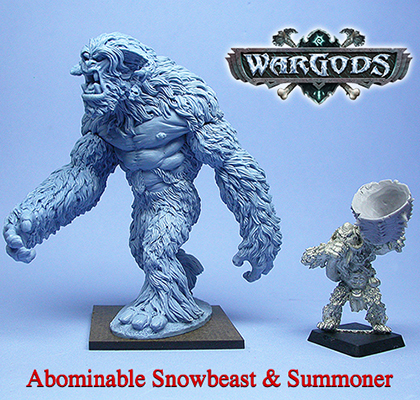 News: The Abominable Snowbeast - remastered! Display models painted by D Felicity FitzPatrick, scenic element by Model Earth, painted by Simon Harris. At last, our new range of Amazons is available now, in the CROC STORE! When we set out to design our new range of Amazons for WarGods, we wanted to make sure they were special. They needed to look beautiful, with a hint of wildness and danger about them. We wanted to make sure that they were equipped to take on any man in a fair fight... our Amazons wear bronze and leather armor over the parts of the body you need to protect -- you'll find no high-heels or chainmail bikinis here! We also wanted them to grounded in reality, and so ours take inspirations from ancient greek hoplites, scythian tribesmen, hollywood, and all blended together to with a subtle exaggeration to give them that 'WarGods' look. We think these women warriors are ready to take on any opponents! The miniatures are based on concept art by Des Hanley, sculpted by Chris FitzPatrick, and painted by D Felicity FitzPatrick. 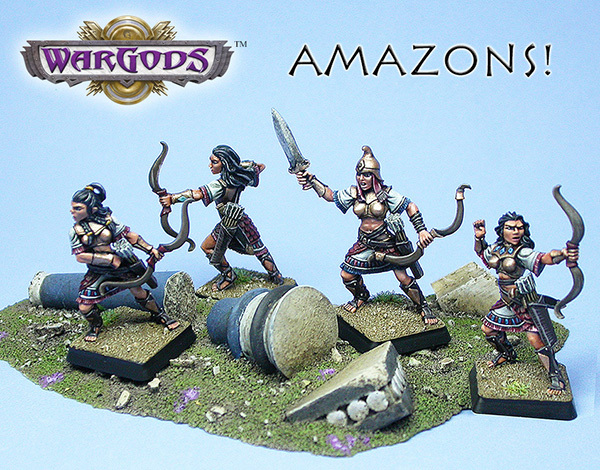 To see LARGER painted images of the new Amazons, check out this thread on the Croc Forum. Still want more? Just wait - Fitz is just finishing up the sculpting on the next wave of Amazons, including mounted archers, armored cavalry, and a mounted version of Queen Penthesilea! We'll be showing them all off in the next few weeks, with pre-order details to follow. News: The Stone Colossus returns, remastered! 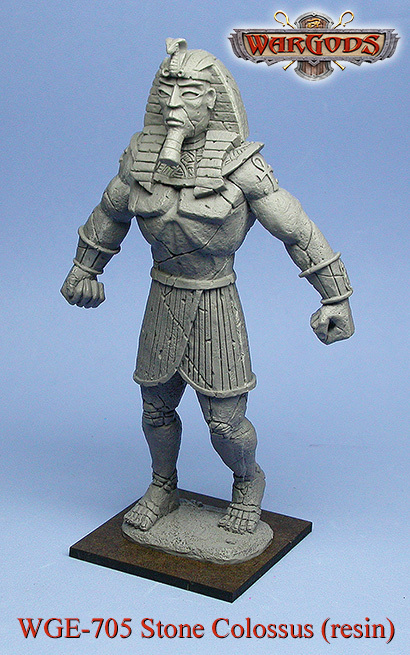 The Stone Colossus has always been a tricky model for us - at over 5 inches tall and made of solid metal, the production cost was extremely high. Not to mention, it was difficult to assemble, and more than a little top-heavy once put together. Well, at last we have found a solution that we are happy with - we have partnered with On The Lamb Games (experts at resin miniature production) to make an improved version of the original sculpt. So what is different? The new Colossus has been remastered from Jeff Wilhelm's original sculpture, but is now lighter, less expensive, and with less pieces to assemble! We've made the feet a permanent connection to the base, and also connected the model at the waist - this means that the finished model on the tabletop will be MUCH more durable. For those who are worried about the detail, the moldmaker did a superb job mastering the sculpture, and the resin castings actually have less distortion than the earlier metal castings. And did we mention that it is now less expensive? We're now able to sell this for $49.95, that is $10 less than the metal casting. For those who still want a metal casting, we do have a few remaining in the store, but once they are gone then the metal version of the model will be permanently retired. 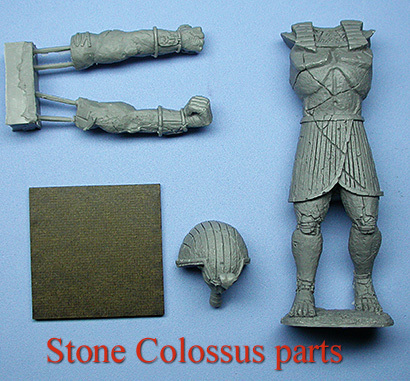 The new Stone Colossus is available HERE. News: First Painted Trojans completed! We got the master castings of the first batch of Trojans from our moldmaker last week, and so we thought we'd show you how well they paint up! Both of these were painted by Debs FitzPatrick, and we think they came out great! Less than a week to go before we start the Kickstarter! For bigger images and to discuss the Trojans, have a look on the: Croc Forum. We'll try and convince Debs to let us all know what colors she used! 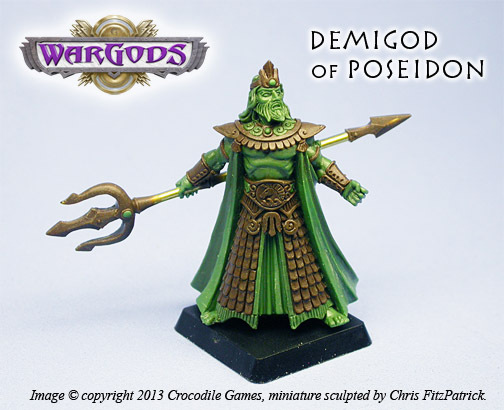 News: Demigod of Poseidon revealed! From the depths of the wine dark sea rises the son of Poseidon! Armed with a deadly trident and wearing scaled bronze armor, he is ready to lead your Olympus warband to victory on the battlefield! With the Demigod of Poseidon you will command the creatures of the deep, ride into battle in a chariot pulled by a pair of magical Hippocampi, and cause the earth to shake and flatten your enemies! 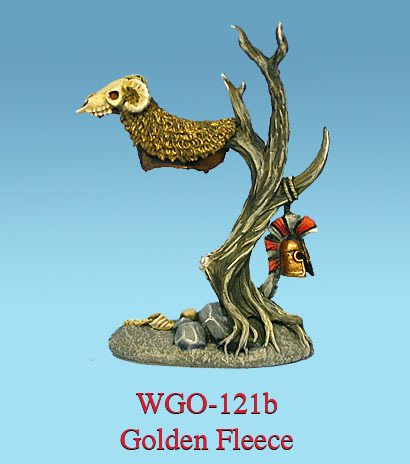 This miniature was sculpted by Chris FitzPatrick. and is based on concept art by Des Hanley. He will be a part of our upcoming WarGods Kickstarter program, starting at the beginning of June! 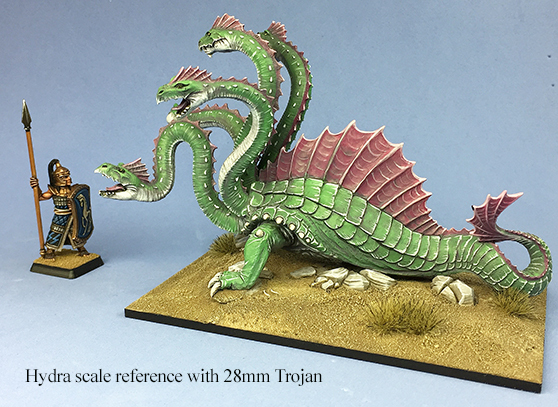 If you'd like to help get this miniature released, please help us spread the word about our upcoming Croc Kickstarter -- we have only a week remaining before the start. You can click on the link below to share the story on your Facebook page.